Acute malnutrition (wasting) remains a major global public concern and a public health priority in Sub-Saharan Africa, especially in countries where high prevalence of HIV/AIDS infection and food insecurity coexist. severe acute malnutrition (SAM), defined by the presence of bilateral pitting oedema or severe wasting calculated as weight-for-height (WFH) <-3 z-score or mid-upper arm circumference (MUAC) <11,5 cm. moderate acute malnutrition (MAM), identified by MUAC between 11.5 cm and 12.5 cm or WFH between -2 and -3 z-score. Acute malnutrition if untreated, especially in severe form, is an attributable cause of the 12.6% of the 6.9 million deaths worldwide among children under five years of age. Management of acute malnutrition requires therefore targeted nutrition interventions. Fig. 1. 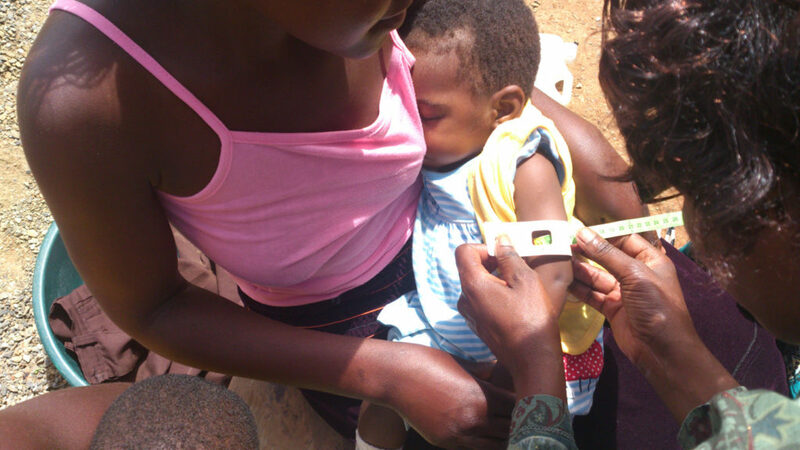 Taking mid-upper arm circumference (MUAC) for acute malnutrition screening. International World Health Organization (WHO)/United Nations International Children’s Emergency Found (UNICEF) protocols recommend community-based nutrition programs for malnourished children 6 -59 months old as an effective method for the management of acute malnutrition (CMAM: community based management of acute malnutrition). The CMAM has been endorsed at international level as an innovative cost-effective approach in low-middle income countries. The CMAM is combining facility and community-based approaches, which reserve inpatient care (IC) based on the WHO recommended management protocol for cases with medical complications, while outpatient therapeutic care (OTP) complemented by targeted supplementary feeding programs (SFPs) are reserved for uncomplicated cases. SFPs are particularly effective in the community management of acute malnutrition, treating MAM and preventing the deterioration into SAM. Community outreach is an essential part of the CMAM approach that contributes to early case detection through community participation, with the aim to reach children before the development of health critical conditions. CMAM results in a substantial increase of program coverage and successful treatment of malnourished children, leading to lower case fatality rates especially in country with poor health systems integration. In the context of a traditional CMAM, the Rainbow Project, under the Association Pope John 23rd, is running 11 SFPs in Zambia (Ndola District) with a particular focus on the community mobilization and capacity building activities. Rainbow SFP activities include on a weekly basis both nutrition-specific or direct interventions (growth monitoring and food supplementation) and nutrition-sensitive or indirect interventions (HIV counselling and testing, health skills for mother on child nutrition and health promotion). In fact, Zambia is a sub-Saharan country facing a high burden of acute malnutrition, remaining one of the most serious public problems among Zambian children under five years of age. According to the Zambian Report of Demographic and Health Survey 2013–2014, the 6% of children suffer from wasting, with a high under-five mortality rate (75 deaths per 1000 live births in a year). The picture of malnutrition is exacerbated by the HIV/AIDS pandemic: when the condition of being HIV-positive coexists with malnutrition, the risk of growth failure and morbidity increases, and children delay recoveries and suffer relapses of malnutrition events, with a longer need of nutritional rehabilitation therapy compared to their HIV-negative counterparts. In Rainbow SFPs, malnourished children are recruited through community outreach or referred from local health facilities. Child nutritional status is evaluated according to WHO/UNICEF methodology. Malnourished children are admitted to SFPs by using a two-priority criteria system of enrollment: first priority is given to acute malnutrition and second priority to underweight status (weigh for age <-2 z-score). As regard acute malnutrition criteria, all children with MAM are eligible for SFPs. Moreover, since CMAM is not fully implemented in Ndola District and at times access to the hospital is restricted, for ethical and humanitarian reasons Rainbow SFPs admit even children with SAM or health complications despite additional referral to the nearest health facility for proper screening. Educational activities for mothers/guardians include provision of health talks and cooking demonstrations. A meal in loco is offered to all of the children attending the program: it mainly consist in porridge prepared with a high-energy protein supplement (HEPS), a specific corn-soy blended food fortified with micronutrients (vitamins and minerals), mostly recommended for the management of malnutrition in SFP. During the whole time of enrollment, ration of general local food coupled with HEPS is provided to take home, to support child nutrition and households diet. Home visits are performed by community volunteers to enhance compliance with nutritional and health advices. In order to evaluate Rainbow SFPs performance, but also to support the potential needs for greater implementation and planning new interventions, a retrospective study was conducted on a sample of 1266 Zambian malnourished children (6-59 months) assisted from 2012 to 2014 in SFPs. More than half of the sample was less than 18 months of age, with children younger than 18 months more likely to be severely malnourished. General outcomes (defined as recovery, death and default rate) showed good program performance when compared with exit categories for targeted SFPs of international guidelines (Sphere Project and United Nations High Commissioner for Refugees/UNHCR). Additionally, outcomes for MAM and SAM were analyzed separately in order to better understand the program performance: Rainbow SFPs proved to be very effective in the management of MAM, with all outcomes meeting the international standards; conversely, outcomes for children with SAM exceeded the international standards, reflecting the most critical condition of severely malnourished children, for whom therapeutic care must be provided, especially when health complications coexisted. HIV infection, very low weight-for-age z-score at admission, and low weight gain within enrollment in SFPs were all strong predictors of program failure (defaulter, death). Specifically, HIV-infected children were almost three times more at risk of death than HIV uninfected, highlighting the role of the vicious cycle between HIV/AIDS infection and childhood malnutrition, and its negative synergic impact on mortality. The management of HIV/AIDS malnourished children still remains more critical since nutritional rehabilitation must be essentially integrated with early diagnosis efforts and adequate antiretroviral (ARV) therapy. FIg. 2. 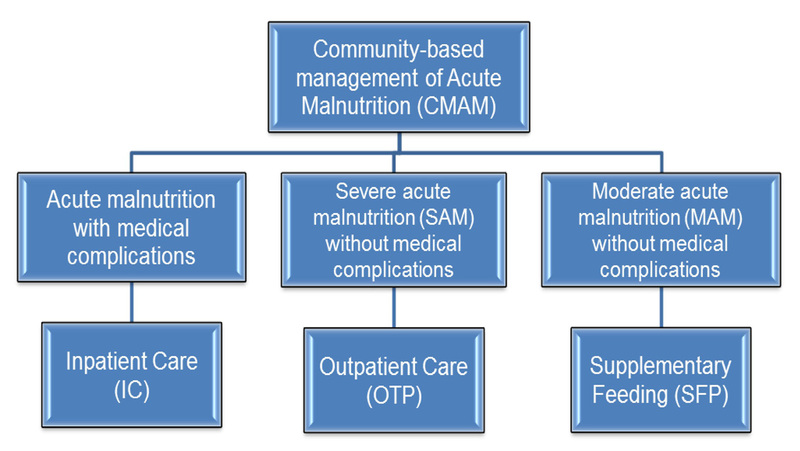 Community-based management of child malnutrition (CMAM) components. The SFPs outcome length of stay exceeded the targets. The low average weight gain suggests that the ration of high-quality food supplementation could be improved. Presumably, with a better gain weight due to a new food schedule, the mean length of stay for recovered children could decrease, improving the long term cost-effectiveness of the program. Rainbow Project SFPs are effective and sustainable in the community-based management of child malnutrition in the Ndola district. Preventing deterioration in severe acute malnutrition, coupled to early detection of HIV/AIDS with adequate antiretroviral treatment, and increasing food distribution (based on redoubling the amount of HEPS) are crucial elements for ensuring full recovery and lowering mortality rates in malnourished Zambian children admitted in SFPs. Meanwhile, education of community volunteers/operators on child malnutrition and HIV/AIDS knowledge needs to be constantly reinforced. Community-Based Management of Child Malnutrition in Zambia: HIV/AIDS Infection and Other Risk Factors on Child Survival.